Selected posts are a regular column, On the Front Lines, at Today’s Practitioner, and are promoted through the monthly newsletter of the Academy of Integrative Health and Medicine. He writes a bi-monthly Industry News column of these highlights for Integrative Medicine: A Clinician’s Journal. Some past articles are archived here at the Huffington Post and here at Integrative Practitioner (search John Weeks). In May 2016, Weeks accepted an invitation to serve as the editor-in-chief of JACM-Paradigm, Practice and Policy Advancing Integrative Health (The Journal of Alternative and Complementary Medicine) where he is particularly pleased to have worked with teams of guest editors to produce a series of JACM Special issues: philanthropically backed special issue on Multimodal Approaches in Integrative Health: Whole Persons, Whole Practices, Whole Systems; a Special Focus Issue on Integrative Oncology; a Special Focus Issue on Naturopathy; and, in the works, one on Innovation in Group-Delivered Services and another on Integrative Palliative Care. In 2014, three integrative health consortia and others combined to grant him a Lifetime Achievement Living Tribute Award. Four academic institutions have granted him honorary doctorates for his work. Seattle-based, he considers himself a particularly lucky soul to have worked remotely while living with his spouse Jeana Kimball, ND, MPH, and their children in Costa Rica, Nicaragua and Puerto Rico for 6 of the last 17 years. A four-page itemization of Weeks’ work is included on pages 63-67 of the Living Tribute. 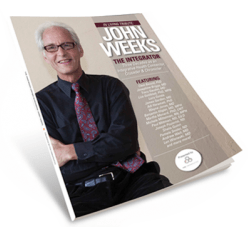 The Tribute booklet includes comments of over 150 leaders in the integrative health and medicine field on John’s contributions. He was surprised with it banquet night at the most significant research conference for the field, the International Congress for Research in Integrative Medicine and Health, Miami, Florida, May 2014.